Cost per person: €2 (free for under 18). Visits may be carried out in Spanish, English, German and French (check availability). N.B. Check the special timetables for Easter, July, August and Christmas. The Codorníu family’s wine business goes back to the middle of the 16th century. A document of that period states that the family had several machines and implements relating to the wine industry. In 1659 Anna Codorníu married Miguel Raventós and the families, each with a long wine tradition, were united. Years later, in 1872, Josep Raventós produced cava for the first time in Spain using the “Traditional Method” and established a completely new industry in the Penedés region. 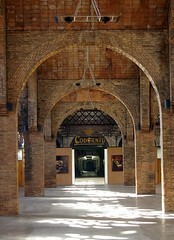 The Codorníu cellars at Sant Sadurní d’Anoia were built on the orders of Manuel Raventós between the end of the 19th and the beginning of the 20th century (1895-1915). At that time Codorníu was producing about 100,000 bottles of cava per year, and the size of the new structure seemed overly grandiose. The location of the winery, then some distance from the road and the railway line, was also unusual for the time. Manuel Raventós, however, was insistent that the family winery should be close to the vineyard as he was aware that such proximity would be the key to improving the quality of the wines. Search for tasting notes on Codorníu, S.A. wines here. Codorníu, S.A. Tasting notes.